Gamer Camp students develop three games across the duration of the course, on a number of different platforms. Check out just some of our students' great games below. 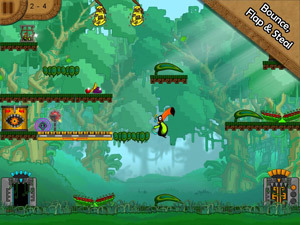 Tubby Toucan - Bounce, flap, steal, and save the jungle! You are Tubby Toucan, a quirky hero who must steal cogwheels from the evil machinery threatening his jungle home. 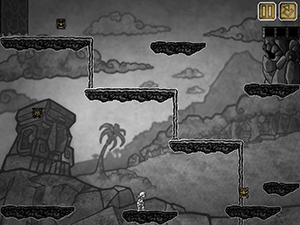 Free your babies and save the wildlife in this cute Mayan platformer! Want to try it yourself for free? Download for iPad 2 or above. 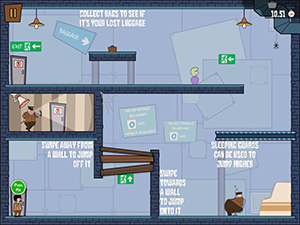 Baggage Reclaim is a 2D platformer based across 15 levels in a 1970s airport. On a flight home from a well-deserved vacation, our hero, the super-cop only known as The Guy, must make his way past airport security to recover his stolen baggage from an evil, underground syndicate of ninjas. Armed only with his handy moustache, a formidable weapon indeed, The Guy will stop at nothing to make his way to Baggage Reclaim. Totem Dash is a fast, compelling platform game. Your character has been shipwrecked on an island, where your presence has angered the native people. 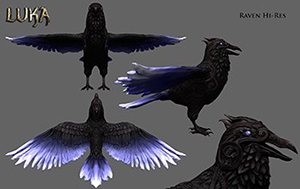 Your task is to collect totems to survive, and if you can collect all the totems you might even make it home. Want to try it yourself for free? Download for iPad 2 or above now! King Cook is a fast and frantic cooking and combat experience. Make clever use of Sony's DualShock sticks to chop, stir and pour to become the King Cook! Learn how to be King Cook. Luka is a 2.5D platformer where you play as Loki to guide a confused Odin through the game. If you succeed you'll bring about Ragnarok. Gastrognome – Food! Fight! Adventure! Gastrognome is a 3D, third-person adventure game, in which you do as much cooking as Mario does plumbing! Use your culinary skills to fire chillies, oil and mushroom bombs at the enemy and fight your way to victory!